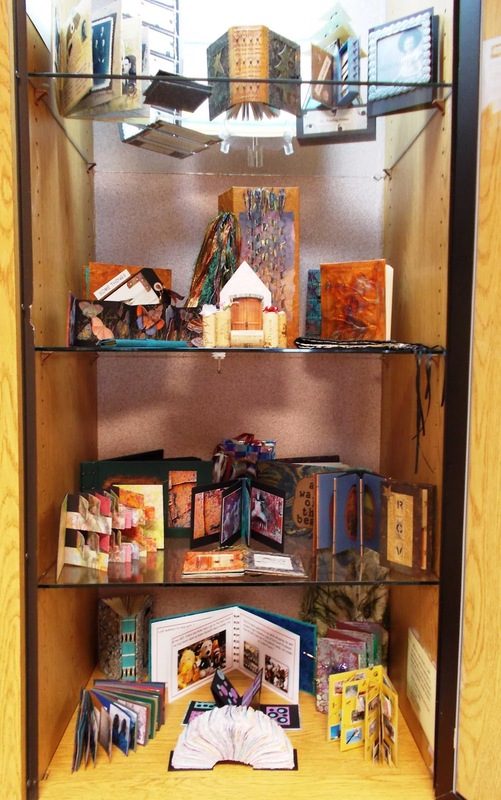 The library kiosk is currently featuring colorful books created by Norbag member, Sandy Vrem. 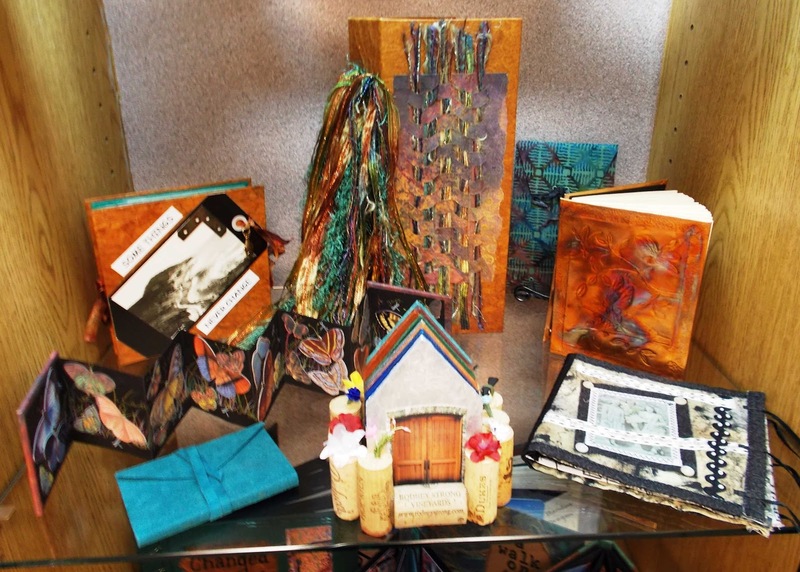 Be sure to visit this display if you want a preview of Spring colors! 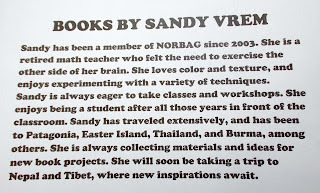 Many of the books feature Sandy's skills with surface design, longstitch, and coptic stitch. 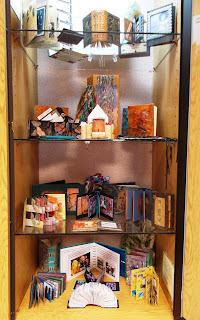 Thanks to Dolores for the photos and Becky for coordinating the display. While browsing through the compendiums and other assorted bits, I came across my Ideas and Inspiration Notes for the first NORBAG workshop I did in 2001. It’s as relevant now as it was then and there are lots of new members who may find them useful and informative.  Make yourself some personal workspace and tidy-up frequently. You will uncover ideas/folds you had forgotten about.  Collect anything that prompts an idea.  Make a scrapbook of simple folds that can be raided and improved upon to provide the basis of a book or an addition to a page.  Make and display the list of exchange themes and look at it frequently to plan and prepare books in good time. 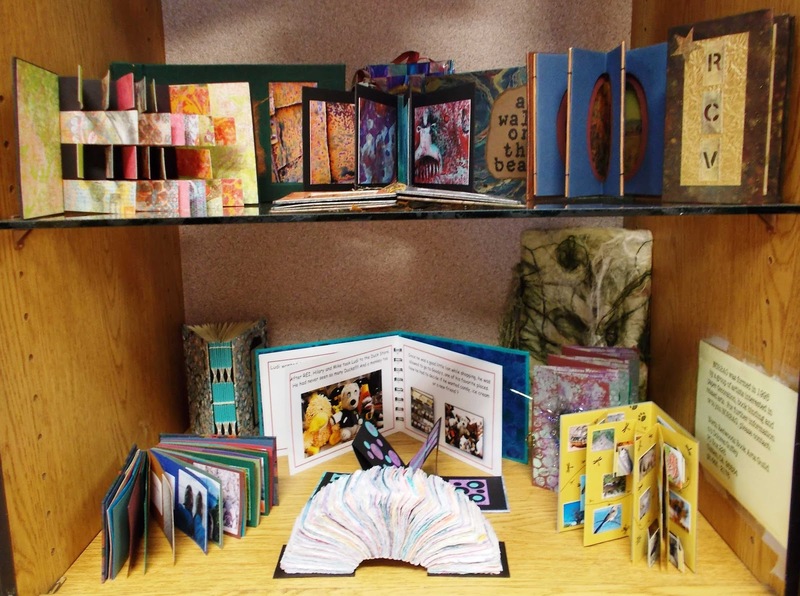  Use the children’s section of the library for any creative subject/children’s poetry.  Use all waking time – and some sleeping time – as valuable thinking time. Never waste a moment. 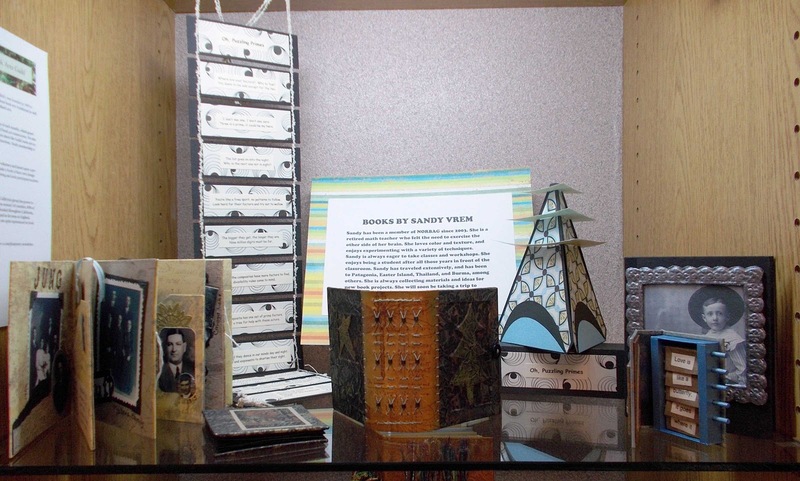 Train yourself to make a book in your head. Techniques can be worked through and problems solved.  Plan ahead – think ahead.  No experience is ever wasted. Make everything work for you.  Don’t expect to have an idea that will equate to your finished book. Expect it to evolve and grow. Take an idea for a walk.  Always have a Plan B !  Keep a copy of everything you make. 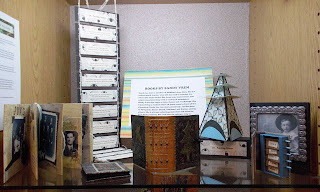 Keep relative items for each book in a ziplock bag.  Re-read your bookmaking books frequently. Some ideas or structure that you overlooked before may leap out at you.  A soapstone marker pencil (actually for dressmaking) is perfect for marking dark papers. It’s easily removed with a soft cloth and can be sharpened with a regular pencil sharpener.  A wallpaper edge roller is excellent for putting extra pressure on folds and glued surfaces.  Use a photocopier shamelessly for reducing/enlarging templates, lettering etc.  Re-cycle. Use old map book pages to make a book about travelling. Use old brown paper bags – crumple first, then smooth, polish with shoe polish, highlight with gold stamp pad for a wonderful effect.  Use a calculator for difficult math when measuring for books.  Try combining several folds or structures within one book.